Back in April 2014, I found on bed on Craigslist that I just HAD to have for Zack’s room. 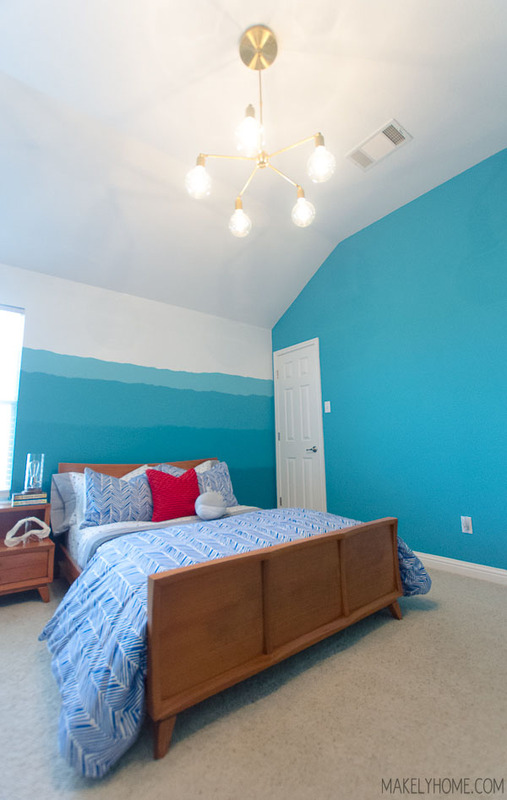 It had great lines and only needed a little work, which sounded awesome after just finishing Emma’s green bed. I wasn’t quite ready to work on it, so I put it aside in the garage. Two in a half years later, I decided that there was no better time than the present. HAHA! Procrastinators unite! 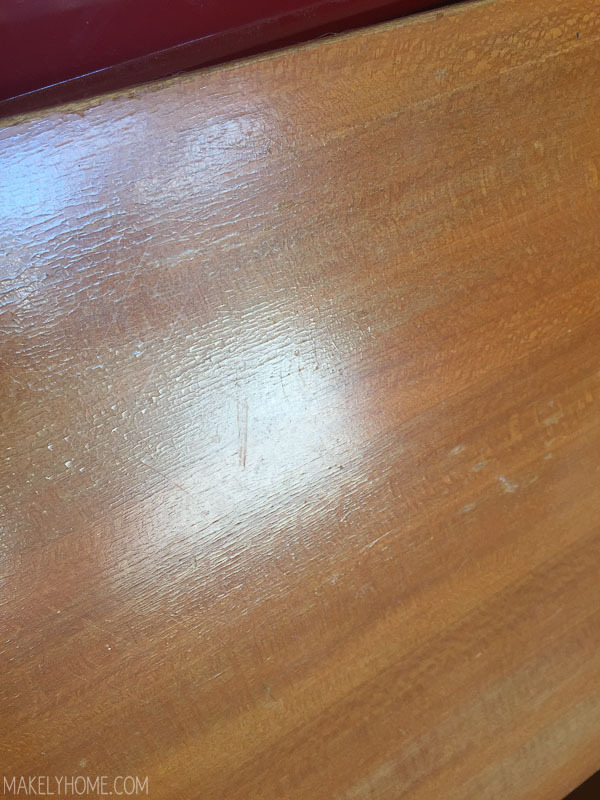 After I got the bed cleaned up, I could tell that the finish on the veneer was peeling and bubbling in places. It wasn’t in perfect shape when I got it, but I’m sure that hanging out in the hot garage for a few years didn’t help its case. 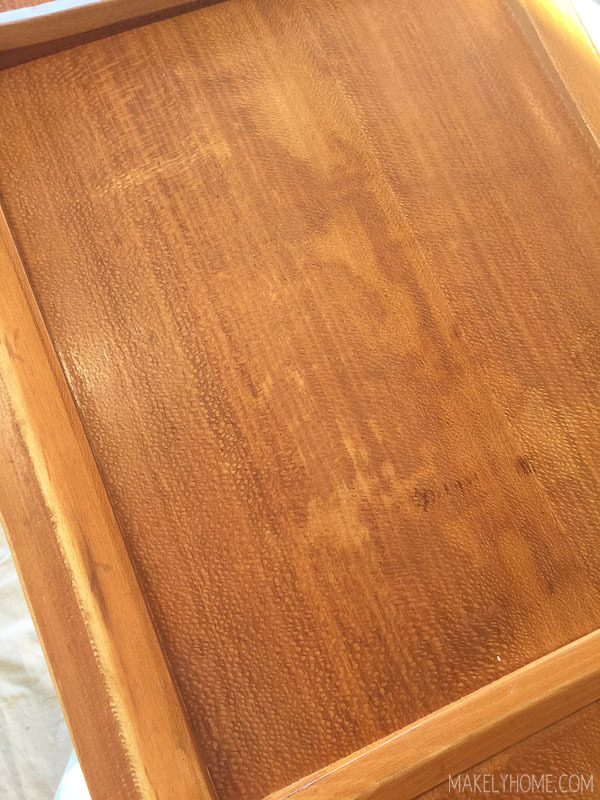 Well, it was time for me to get started refinishing furniture again. I decided to do some light sanding on it to see what would happen. 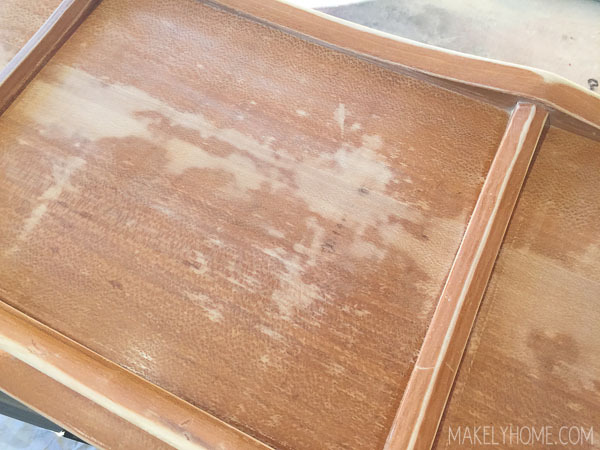 It’s always touchy when you sand a thin veneer, because if you can easily go through the veneer. Like this. Okay, so that’s not EXACTLY what happened. 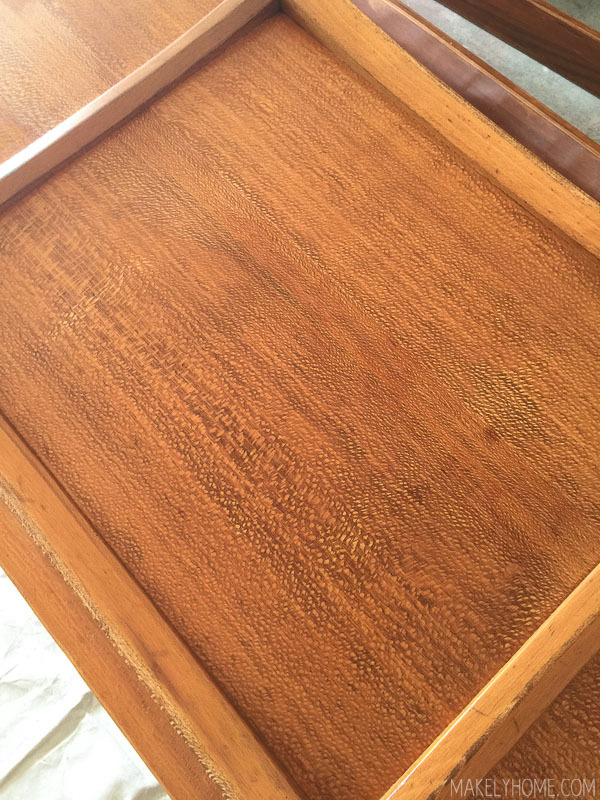 The veneer was pretty marred in these spots and felt really rough, so sanding it down was a decision that I made and not an accident. But, it could easily happen if you aren’t careful! Because I just couldn’t handle this turning into a multi-day project, I started thinking about how I could save this bed. I could paint it, but I really didn’t want a painted finish. 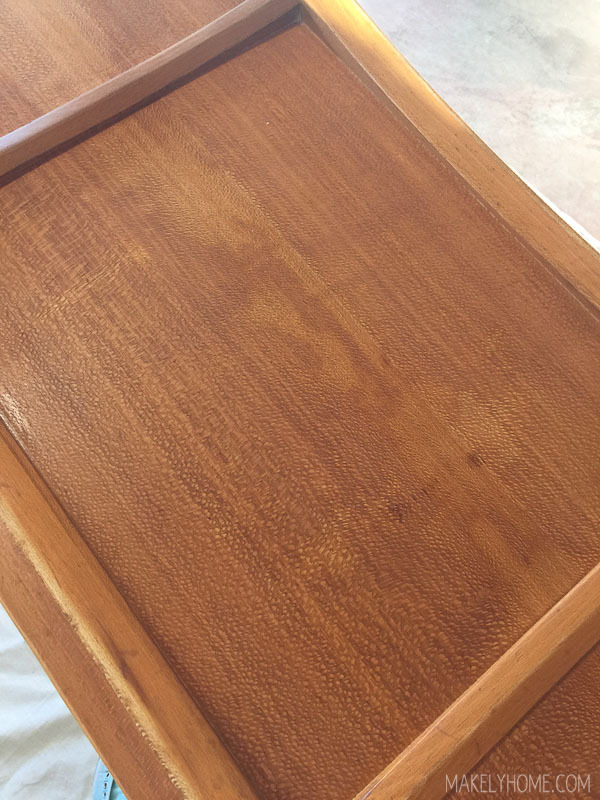 My friend Marian suggested that I use a chemical stripper to take the stain off the veneer (which was actually the “right” thing to do), but that made me feel like Andy from Wet Hot American Summer. So…that wasn’t going to be the right answer for me. My friend Mandi suggested that I try Restor-A-Finish, which is basically a finish restorer that you wipe on. I used the Walnut tint, and this was the result after the first application. Better, but not perfect. So, I tried Restor-A-Finish a second time. Much better! But, was it good enough? Well, it still bugged me, so no. YAAASSSSS! Is it perfect? Heck no! Is it good enough for me? Yep. Once I got the bed in the room, I think it looks great! The room doesn’t have a lot of natural light, so I think the flawed finished is far less noticeable than it was in my sunlit garage. In fact, It looks almost 100% more flawed in these edited images than it does to the naked eye. Let’s talk about the bedding for a second. It doesn’t seem to make a lot of sense color-wise right now, but it will when I’m finished with the room (here’s the original plan.) But there are two things I want to point out. First, it’s totally okay for boys to have a mix of patterns in their bedding. It’s all the rage for little girls to have a mix of stripes and dots and florals on their beds (and clothes), and I think the same thing applies for boys. 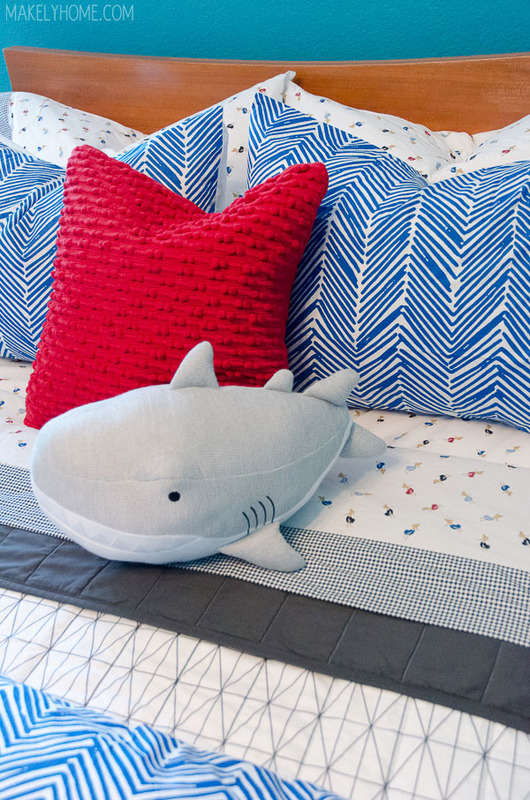 Zack’s bedding is a mix of geometric designs and a little bit of kitsch. Second, I want to point out the hula girl sheets that I found for a steal at Tuesday Morning. HULA GIRLS! I was afraid that Zack wouldn’t like them, but he loves them. It takes a special person to put hula girl sheets on their 9 year old’s bed, but I totally did it. I will have better shots of the bedding once the room is closer to being finished. I’ll be honest – there are still piles of random stuff in the corners of the room, so I wasn’t able to get good shots and hide the junk. Keeping it real, y’all! 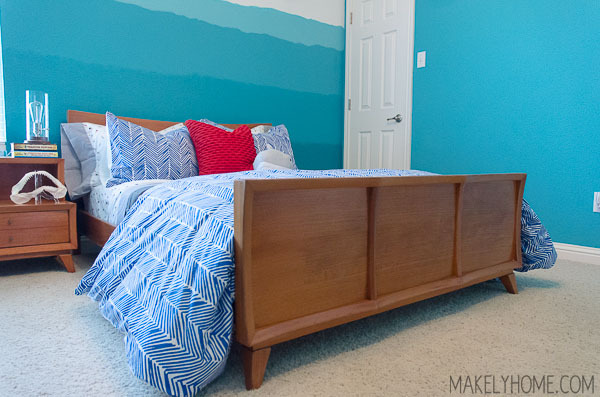 But the lesson in all of this is that it’s okay to buck the boundaries in a room – the imperfectly finished bed, the pattern play on the bed, the hula girl sheets. Above all, have a good time working on your home! Don’t make decorating your home feel so stressful that you want to have a tantrum. Make it easy and fun, and if you are feeling stressed out, just stop for a while (or two and a half years, like I did). This is the good stuff in life, y’all. Enjoy it! OMG… I love you. Can we be best friends??!!! I am cracking up and loving it all at the same time!!! I don’t feel so bad about the unfinished projects in my home!!!! Thanks for keeping it real!!!!! That also means that at some point it is also do-able for the rest of us!!! Have a great day! You totally made mine!